While the world’s attention is riveted on Syria, the US is significantly boosting its forces in Europe. And these are not just divisions streaming in to take part in some exercises that will leave once those are over. This is a serious buildup to create a potentially offensive posture. The beefing up of the US forces is taking place amid preparations for a Russia-US summit. That’s a rather peculiar background for the event, to put it mildly! The 4th Combat Aviation Brigade and the 4th Infantry Division will deploy to Europe as part of its Operation Atlantic Resolve. Based in Germany, the forces will participate in multiple exercises, most of which will be held very near the Russian border in Poland, Hungary, Romania, and the Baltic States. The Army is considering deploying an entire division in a Reforger type of exercise, with troops coming over to use the pre-positioned hardware. Those forces could potentially see a surge, with a division-level deployment in late 2018 or 2019. The plans include the creation of a rear-area operations command to be hosted by Germany. Another command is planned that will ensure mobility in the North Atlantic shipping lanes. A “military Schengen” to allow easy movement across borders is under consideration. 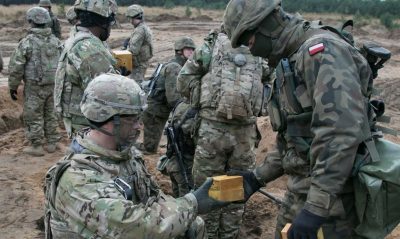 NATO is rotating four battalion-size, combat-ready, air-power-supported battle groups throughout Poland — which is hosting 800 American troops — and the Baltic States. In February, the US Army held the largest artillery exercise in Europe since the Cold War. The event was dubbed Dynamic Front 18 and involved seven rocket-launching systems, 94 artillery pieces, including eight German Panzerhaubitze 2000 armored howitzers, 14 British L118 light guns, and 18 US M777 155 mm howitzers. The US military command is weighing the option of keeping the USS Harry S. Truman carrier strike group in the Mediterranean, the European command’s area of responsibility, instead of deploying it to the Middle East, which is under the control of Central Command. The group left Norfolk on April 11. This move would be intended to “check Russia,” freeing other American naval assets to carry out missions in the Baltic and the Black Sea. Defense Secretary Jim Mattis told the House Armed Services Committee on April 12 that he was studying the possibility of shaking up his department’s employment of carrier groups. The rotational deployments have been increased from the traditional six to ten months. A large number of US ships are concentrated in the vicinity of Syria. Meanwhile, around 3,600 American soldiers have landed in Jordan. They are participating in the two-week US-Jordanian exercise, Eager Lion, which kicked off on April 15. The training event is a drill for AV-8B Harriers, MV-22 Ospreys, and attack helicopters. It follows the US, UK, and French air strikes on Syria. The situation in southern Syria is fraught with conflict, which might easily pull in US and Russian armed forces. In his remarks about a possible Russia-US summit, Russian Foreign Minister Sergei Lavrov stated that he is confident Russian and American military leaders will prevent an armed conflict. US officials have said many times they are ready to do anything to keep hostilities from erupting. Well, that’s what they say, but actions speak louder than words. Forces are amassing that are poised for attack. The US deployments cannot be seen as anything other than war preparations that are already well underway, and Moscow has to be doubly vigilant. The two nations’ leaders will have a host of urgent issues to discuss, but moving to tame the heightened tensions would be a step in the right direction. Some things could be done without delay, reviving some existing agreements that have been undeservedly forgotten for instance, such as the 1989 Prevention of Dangerous Military Activities Agreement or the Incidents at Sea (INCSEA) agreement of 1972. The INCSEA stood both parties in good stead, preventing a military clash between the Soviet and US navies during the 1973 Yom Kippur War. It can do so again in the same region. Provocative military deployments in Europe are hardly the way to create a propitious environment for a summit. Nor do they enhance the security of the United States. But they are taking place, poisoning the atmosphere and creating a big problem.